St Peter's is one of three medieval churches in Nottingham. A church has stood here since Norman times. The original structure was burnt down in 1140 when Empress Matilda, in her battle against King Stephen, took the town of Nottingham and razed many of the buildings to the ground. 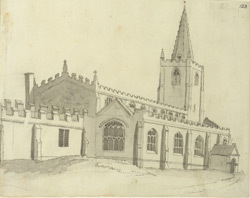 The present church was built sometime towards the end of the 12th century, and claims to be the oldest building in Nottingham in continuous use. Of the other two medieval Nottingham churches, St Mary's was substantially rebuilt in the 15th century, and St Nicholas' was destroyed during the Civil War and rebuilt in the 1670s. Empress Matilda was daughter of Henry I and mother of Henry II.